Size 17"x6"x6" - Because this trap is designed with precision and engineered for smooth, easy action, setting it, using it, and catching animals has never been easier. This trap is very simple and efficient to use from start to finish. The spring loaded door and sensitive trigger ensures a quick, secure capture. All you have to do is add the bait, set the trap, and then release your catch. READY TO USE RIGHT OUT OF THE BOX - This trap is made with Heavy Duty, Durable Steel to ensure that it gets the job done. And there are no confusing, cumbersome directions to follow or complex pieces to put together. Each trap comes fully pre-assembled and is ready to set in your yard, garden, or even the woods behind your house the moment it arrives on your doorstep. 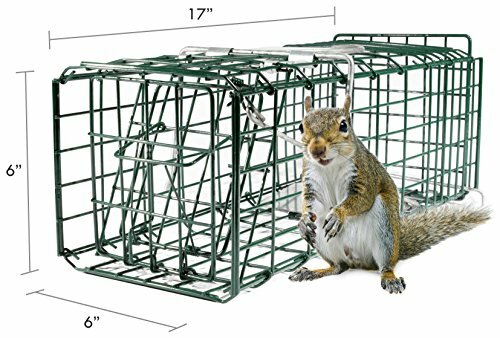 CRUELTY FREE - Since this trap was created for SAFE AND HUMANE trapping with NO injury to the animal, it's the perfect solution for trapping Rabbits, Squirrels, Moles, Gophers, Opossums, and Skunks. The internal edges are completely smooth, to offer additional protection and ensure there will be no injury to animals. IT'S USER SAFE - The humane animal trap from Parker 8 uses two specific layers of protection for you. Because it has a solid door design and with handle guards, you'll be protected during handling for the transportation and the release of the your catch. YOU'RE GUARANTEED TO GET THE JOB DONE - If for any reason, you aren't happy with your Animal Trap just send it back to us for a prompt and full refund. We want to help you make life easy, and keep unwanted animals out of your yard or garden and return them safely to their natural habitat. If you don't feel like we have done that, let us know. So click the Add to Cart button now, knowing your purchase is protected with our Money Back Guarantee. If you have any questions about this product by Parker Eight, contact us by completing and submitting the form below. If you are looking for a specif part number, please include it with your message. NETCAT Wasp Trap Catcher, Wasp Repellent,Perfect Outdoor Solar Powered Trap with Ultraviolet LED Light for Yellow Jackets, Bees, Wasps, Hornets, Bugs and More.